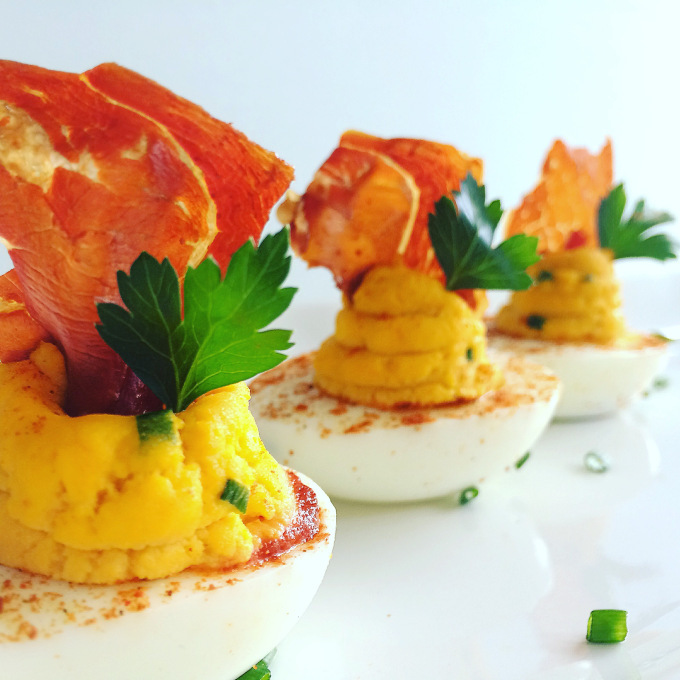 Deviled eggs are a classic appetizer that never gets old. Especially when there are so many variations to try. I wanted these eggs to be spicy, mixing sriracha with the yolks gives it a nice bite. And with an extra hit of heat from a drop of sriracha on the bottom, it makes for a surprising spicy bite. The Serrano ham adds a salty crunch which is a nice contrast to the creaminess of the egg. Place the ham on a lined baking sheet and bake for 10 minutes until crispy. Remove from oven and let cool. Peel hard boiled eggs, slice in half, remove yolks to a medium bowl. Place the egg whites cutside up on a large plate lined with paper towel. Add the mayonnaise, sriracha, lemon juice, salt, and pepper to the yolks. Mix until smooth. Add the chives and mix well. Place a pea sized dollop of sriracha in the bowl of the egg whites. Then fill egg whites with the egg yolk mixture. Break crispy ham slices into bite size pieces and top each egg with a piece of Serrano ham. Garnish with a parsley leaf and a sprinkle of paprika. These eggs are delicious but do not keep well. So make as many as you need and eat them that day.